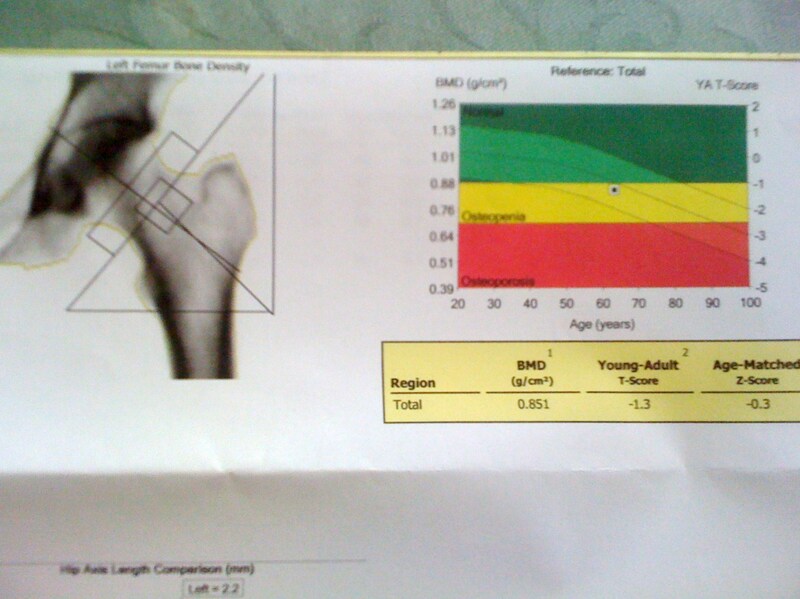 On Friday I had a bone density scan. These were being offered free by a medical research company, looking for women with Osteoporosis to take part in medical trials. In the NHS in the UK does not offer routine screening for osteoporosis at present. The good news is that I don’t have osteoporosis, but the bad news is I do have something called Osteopenia. Which means that the minerals content in my hip is just below the acceptable level. Ironically the mineral content in my spine is very good. Therefore the even better news is that I can make lifestyle changes to stop the onset of osteoporosis Which basically means Vitamin D and calcium supplements and weight bearing exercise. I try to keep fit and healthy and eat a good diet, but I have been a smoker, (forever feel guilty about that!) had an early menopause at 43, I am white and female. All risk factors. Thank goodness I have not really been a serial dieter, never really had the self control. I have watched my weight, but have controlled it by stopping eating cakes and sweet things and increasing exercise, rather than cutting out essential things like dairy foods or good fats and feel concerned for the young girls of today who do. This brings me to smokers guilt. I was introduced to nicotine by my driving instructor at 17 and over the years have stopped and started smoking for long periods of time. The longest period of abstinence being 7 years. At my worst I was smoking 50 full strength cigarettes a day, but that was when I was severely depressed and ill.. Usually I was a 20 a day girl, but as smoking became more unacceptable socially and it became more difficult to smoke in the in the workplace or in public places, my habit was cut to about 5 a day. To my shame I smoked during my first pregnant 38 years ago. To be fair it was not known exactly how harmful smoking in pregnancy was then, but I should have known better. I didn’t smoke a lot, no more than 5 a day as I went off the taste. Then I gave up completely six weeks after the baby was born. This is when I stopped for 7 years.. Not sure why I started again. This was a bad time in my life, I was drinking heavily and I can’t really remember. Then I stopped and started with monotonous regularity. On for a yesr or a few months, then stopping for two years, five years. Strangely I found it more difficult not to start smoking again than I did drinking. *I think of it as the monkey on my shoulder. out of the blue he would whisper “nobody will know, one will not do you any harm, you can stop any time and off I would go again and get hooked. Usually on a girls weekend away or night out. Every time I just knew haw stupid I was. But nicotine is a very powerful drug. Always waiting to pounce when I least expected it and once I was hooked I had to go through the withdrawals again, making everybody around me miserable. Nicotine replacement never worked for me. I just got hooked on the replacement. The worst bit was smoking in secret and not at home, so by 8pm at night I was grumpy and angry causing so many arguments. Eventually I would only smoke when in Paris. Just for a weekend usually. Those very attractive slim feminine Vogue cigarettes. I could easily stop when I got home, then about three years ago I found had a persistent cough and panicked thinking I had emphysema or lung cancer. Eventually an x ray showed a chronic chest infection which was easily cured with antibiotics, but there WAS damage and I now hope I have managed to kick the monkey. But I never say never, just one day at a time! I don’t feel I have a second chance. If you ever see me with a cigarette in my hand again, kick me! So now I am off to dance around the living room! Tags: Osteoporesis, smoking.. Bookmark the permalink. Previous post ← LOVE AT FIRST SIGHT?…………. What kind of weight bearing exercises will you do? My doctor just prescribed a single mega dose of Vitamin D after my blood test showed that I was deficient. He said that most people (something like 70%) are severely lacking in Vitamin D in Paris because we don’t get much sun. I would imagine that it must be even worse in England. After taking it, I’ve noticed that I have more energy and that I’m in a better mood, even during this long rainy spell. I hope that you’ll find positive benefits from taking supplements as well. Do you know if they prescribe single mega doses in England? And if I ever see a cigarette in your hand, I promise to kick you … well, I probably won’t kick you but I will remind you that I’m supposed to. Mary Kay. I have an appointment to see my Gp soon, but from the information they gave me at the research centre and what bit I have found out from googling I have just upped my usual daily dose but I have seen what you mean about mega doses. As for weight bearing exercises. We I usually cycle everywhere so aim to increase my walking, but this is restricted by plantar facinitis……all the more reason to take more trips to Paris where you have no choice but to walk alot! So pleased you don’t have osteoporosis. My sister in law has it and is terrified of falling so she doesn’t leave the house in winter if there is any sign of frost. And I will definitely kick you if I ever see you with a cigarette! Thanks Janet. I darn’t smoke now in front of any of my friends!! LOL! As screening is not routinely done in the UK, I wonder how many women here have this condition. I think this is very near sighted of the NHS as it must cost millions to treat people with broken hips and bones every year. I saw the squats when I googled appropriate exercises, will try them. I don’t feel much like talking about health issues these days but I’ll just say that I’m there with the Osteopenia, Vit D and Calcium deficiency and nicotine addiction. I take it that screening is routine in the US as you both know about the condition. Hope your health worries are sorted soon Sylvia. You said it: “One day at a time” or ODAT (haha half raised in an AA home). But there really is power in taking things step by step, day by day, even hour by hour. It makes goals and lifestyle changes seem much more manageable. I too am glad that you don’t have osteoporosis. Let me know if you need any good at home workout routines. I have some good ones and I SWEAR by them! Thanks for the offer of home workouts, seems like just what I need. Yes AA has been a big part of my life also for along time and I applied the principles to stopping smoking the same way, but unfortunately I relapsed far too often. Still I also learned that one slip does not mean a complete fall and tried again. I, too have Osteopenia – have had for several years – have been on Vit D and calcium supplement regimen for years as well as lots of weight bearing exercise – must be working as my last bone density showed slight improvement – which is one reason that I’m very faithful with the exercise routine. My Dr. wants me to have the Prolia (sp) injection but the side effects are scaring me off – don’t think it’s been around long enough to really know what it does to the body/bones! Now, if I could just quit the nicotine habit!! Very tough drug to get away from and my Dr. won’t give me an Rx for Chantix as it can be mind altering in some people – I have cut way, way back – only having 4-5 cigs a day so I’m making progress! Good luck with your progress – just be very faithful about the weight bearing exercise – it really does help! Hi Sandy, have you tried an electronic cigarette? That’s how I quit after I started smoking again after having quit for 7 years! They’re everywhere already in the USA, don’t know where you are but maybe you want to look it up? And once a smoker we’ll always be in danger to fall back…it’s pretty awful but yes, it is an addiction. Congratulations Sandy in cutting down to so few now. Good luck with your progress. Everybody needs to find their own their own method, be it Nicotine replacement or cold turkey. For me it has to be cold turkey. But I think what is important is finding motivation, one day at a time, Without that nothing will work. You sound like you may have found yours in your family wedding. Good luck with it. In the end for me , apart from the health anxiety, it just became too much hassle sneaking around to smoke and continually withdrawing and being grumpy! Hi Sylvia – Thanks for the info – no, I have not tried an electronic cigarette – I’m assuming that they are readily available here – will have to check that out. although, I don’t want to start one habit to get rid of another!!! I think I’m on the way to really quitting for good – it’s difficult to limit myself to having so few cigs a day but for right now, it’s easier than going cold turkey!! Plus, I am really going to try to cut down even more as we are going to my husband’s grandson’s wedding in Chicago the first part of March – will be around his family the whole weekend and I don’t smoke in front of any of them – that may be just the incentive I have to give it up totally!! And believe me, I do know the pitfalls of quitting and starting again – have done it many, many times – hopefully, this next time I quit will be the last – for good!!! Thanks – I will need lots of luck! Denise – I didn’t mention the “sneaking around” that I do to smoke as I am a closet smoker – as much as I LIKE smoking, I think I DISLIKE the deceit more!! My husband is one of the most honest and trusting people I know and I feel like such a worm that I am smoking behind his back – just doesn’t feel right anymore which is one of the big reasons that I must quit totally – tired of carrying around all that guilt and knowing that he would be so disappointed in me if he found out! Sandy, I know exactly what you mean.. ( and we sneaked around enough together so I know, you know, I know! LOL!) . I can tell you the freedom from that guilt and the sheer energy it took is SO worth the effort of stopping. Good luck with your attempts to stop. Denise – LOL! Yes, we did sneak around didn’t we?? Gave me a good laugh when I thought of that night in London – we caught each other – who would have thought that you would be out roaming around?? And I’m sure that’s what you thought when you saw me out roaming around!!! Good memories!! It is a lot of work/stress to find a way/place to sneak a cigarette – I can appreciate that it would be a relief to be free from expending all the energy on such a waste of time!!! Maybe this wedding is a mixed blessing! Thanks for the encouragement – I’m trying my best! Glad you caught it with time to do something about it! And glad smoking is not one of my many vices – went through a couple of relatives dying of smoking-related illnesses as a young child and it seemed to do the trick for none of us ever smoked in my family after that. Good luck keeping on keeping on! Gwan, thanks for dropping by. You are very fortunate never to get hooked on nicotine. Apart from anything else just think how much money you save!!! I haven’t had a cigarette for over 27 years, gave up completely at my 3rd attempt. Trying to get pregnant was my motivation and it must have worked! Still occasionally fancy one though even after all this time! Isn’t it funny how you can just not imagine some people smoking? Janet you are one of them. I will kick you too if you ever fall b the wayside! LOl! I have never smoked tobacco in my life. It is a weird quirk about growing up in California, where we were raised that it was absolute evil while at the same time my friends’ parents were growing pot in their backyards. As for Vitamin D…. I think I even ranted about it in my blog. EVERY woman needs to get checked. The women in France have higher rate of deficiency than the women in refuge camps in the Sudan. Save your bones, madame!!! Oh yes I remember the post. I don’t actually know if my Vitamin D levels are low as I have not had a blood test yet and I don’t really know how common osteoparenia is in women of my age. But it is a good wake up call and I certainly will look after dem bones! Late to the party and catching up on all my Muriel blogs. Dear Denise and Sandy, hang in there!! Quitting smoking was the HARDEST thing I’ve ever done!! I managed to finally do it using Nicorette mints. I quit when I was pregnant with Jordan and started back when she was 6 months, sneaking all the way. My husband dragged me kicking and screaming into this non-smoking world. And now I am so glad he did.